Jeff Rapp and Martha DeHart. 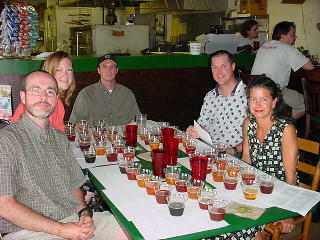 Owen Ogletree (director of Brewtopia Events LLC) gathered together some of his fellow beer enthusiasts on June 25, 2003 at Athens' Mellow Mushroom (Five Points location) to sample and comment on several mixed styles of ales and lagers. This beer sampling was done as a blind tasting where no one was aware of the brands that were being served. Beers were informally commented upon and ranked according to Beer Judge Certification Program (BJCP) style guidelines. First, second, third places, and honorable mention were awarded to the beers we felt represented their individual styles in extraordinary fashion. Drop Owen an email to share your comments and opinions. Mellow Mushroom was gracious enough to host our evaluation of these beers. 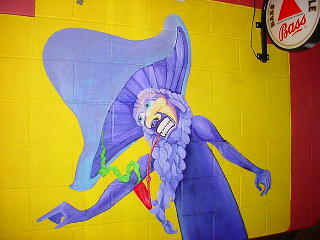 Visit the pub soon for a fine selection of beer and delicious pizza and sandwiches. Aroma: Malt, mild roast, mild caramel. Nice. Appearance: Dark brown in color. Hints of ruby in the light. Flavor: Good flavors with a beautiful coffee/roasty aftertaste. Mouthfeel is medium. This is a very drinkable Porter with subtle hints of caramel, chocolate, roast, and hops. Good job. Aroma: Malt aroma with smoke, hints of roasted malt, caramel and butterscotch. Appearance: Dark amber with an attractive, creamy white head. Flavor: Malt and lots of peated smoked malt. Creamy, toasty, malty -- but a bit dry for style. Smoke may be a bit much for some, but most of the tasting panel thought it was delicious and distinctive. Aroma: Hoppy with spicy American hops. Malty, caramel notes, slight fruit hints. Appearance: Dark copper, clear, no haze. Flavor: Hint of resiny American hops? All UK hops would be better for style. This is a nice ale with clean, dark malt hints and a delicious flavor -- very drinkable. A complex ale with a good depth of hops and malt. Aroma: Fruity and grape-like with a very mild hop aroma. Appearance: Golden and clear with nice carbonation. Flavor: Fruity with low levels of malt. Bittering hops are high -- more flavoring and aroma hops would be nice. Hops used are a bit medicinal and astringent on some sips. Overall, a very good attempt at the style. Aroma: Cherries, fruit, spice (nutmeg?). Smells like a cherry pie. Aroma is a bit like soda pop. Appearance: Slight haze with a nice pink foam. Color is attractive and very red. Flavor: Rich cherry with tart hints. Spices and cherry dominate the flavor profile -- very intense cherry. There is more cherry here than beer -- a bit out of balance? Very flavorful. Aroma: Malt, sulfur hints, faint alcohol notes. Appearance: Light gold in color with a nice white carbonation. Clear and attractive. Flavor: Malty, but with too many hops for this style. This is a bit bitter and Pilsener-like -- needs more body, malt, and alcohol to be a true Doppelbock. However, this is a very appealing lager. Aroma: Malty with tea/tannin/wood aromas. Smells of toast, flowers, and light fruit. Appearance: Clear and amber in color with good head retention. Flavor: Too fruity for style? Needs to be more woody from the hops. This beer is not very hoppy -- a good beer, but not really a perfect Steam Beer. Rich malt is flavorful. Aroma: Very mild aromas of clove and wheat. Appearance: Golden and cloudy. Very pleasant appearance with nice head retention. Flavor: Wheat/cereal flavors dominate. There is very little Barvarian complexity -- needs more phenols and clove. Tastes like an American Wheat Beer. This is a very refreshing, wheaty ale that needs more yeast complexity to fit into this style. Aroma: Fruity with hints of plums and caramel. Slightly tart aroma with malt and hints of celery. Appearance: Nice copper color with good head retention (for this style). Clear and beautiful. Flavor: Hint of medicinal, starchy grain character? Hops are nice (woody and English in character). Good crystal malt and esters. This bottle could be a bit old -- this style does not age well. Otherwise, this is a good version of a Best Bitter. Aroma: Too hoppy for style. American hops cover most of the malt aromas. Appearance: Dark copper / light amber / clear. Flavor: Again, too hoppy for this style. Needs more malt and perhaps some peated smoked malt. There are toasty hints. This is a delicious, creamy ale that is a bit off style -- it is more like an American Amber Ale. Aroma: Fruity with a floral, berry-like, perfumy aroma. Appearance: Medium gold with attractive head. Appearance is perfect for style. Flavor: A bit too sweet for an IPA. Grassy and malty with not enough hop component. Too smooth and sweet for style -- needs more hops in flavor and bitterness -- lacks hop depth and complexity.